As you probably know, these last few weeks we have been working on multi-version support in the Scala IDE. We had previous blog posts describing things here and there, but only the latest nightly, Scala-IDE 4.0.0-M3, presents the full set of features. This is the latest update on what you are getting with multi-version suppport in there. So far the Scala IDE was therefore built on and for a specific version of the Scala Compiler. For editing 2.10 projects, you had to have a version of the IDE compiled for Scala 2.10. For 2.11, you had to have a version compiled for Scala 2.11. This led to users working with both 2.11 and 2.10 projects having two installations of Eclipse, with different flavors of the Scala IDE plugin installed. This also constrained us developers: since most of the IDE’s source code had to pass compilation with both 2.10 and 2.11, it was impossible to remove some obsolete things, led to some regression headaches, and made use maintain two parallel branches for the source. That’s it ! You project will be built with the version of Scala you just chose, and the presentation compiler of the IDE will process your code in the compatibility mode corresponding to that version (if appropriate). Also, note this setting will not affect what your projct is built with. What your project runs on is, as usual, the compiler it finds on classpath. 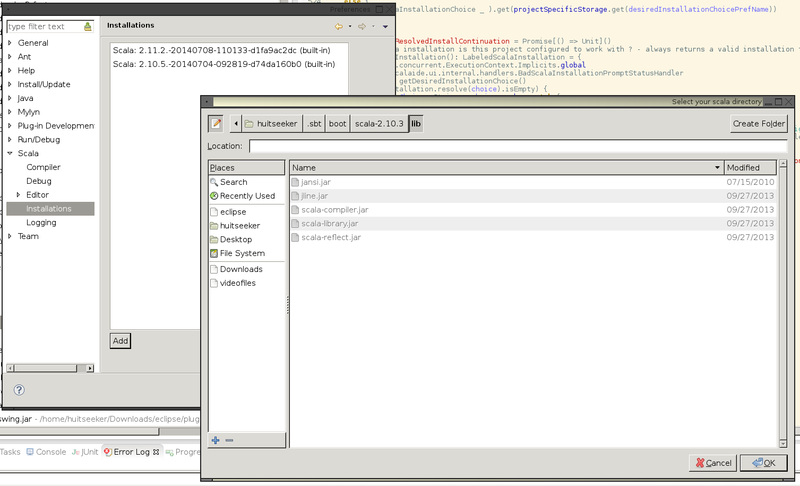 But what is actually found on classpath may vary according to your project’s specific settings. The IDE will try to understand what version of Scala your project is designed to work with. It does this by looking at your resolved classpath. A resolved classpath means “expanded until it explicitly contains just paths to existing files”. ⁷ Files in that classpath will possibly contain a scala-library jar, in which we know where to look for a version, or other, external jar files which filename might hint at a Scala version. Opening Project Properties here (by clicking Finish) is equivalent to doing it through menus, It will toggle project-specific compiler settings if necessary, and set the correct compiler flags. A similar error marker will pop up if you have external 2.10 libraries in your classpath (e.g. if they were brought there by sbteclipse with cutom options). 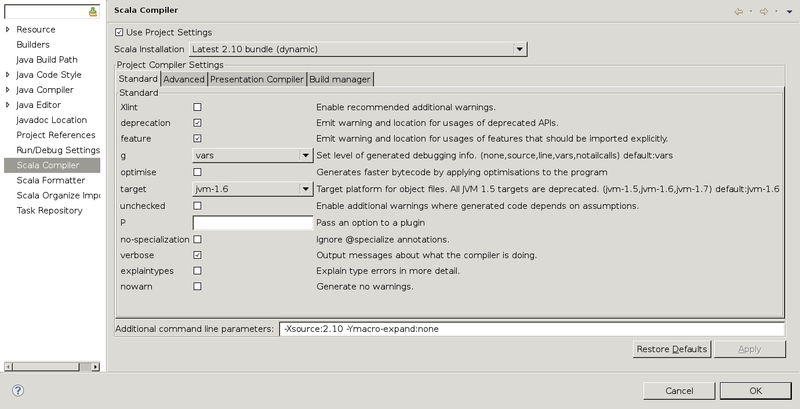 Now, if you have a project that was created in Eclipse, or if you are working on a project which Eclipse configuration has been generated in the past with a vanilla sbteclipse (with no particular options), you may notice that those error markers do not appear. This is because your project is using a Classpath Container. Basically, classpath containers are an indirection in your classpath that is elaborated by the platform Eclipse using settings.They’re the technical notion behind the Eclipse feature named user libraries. Your project’s physical representation contains a string (a classpath container path) in its classpath, that Eclipse resolves depending on its own settings and context.⁸ This has been the way Scala projects in the IDE have been dealt with so far: your projects contained that indirection as a pointer to a Scala compiler, so that as you updated your ScalaIDE plugin over time, your projects were always built with the latest version of the scala compiler embedded with the IDE. This will let you have a project whose classpath is managed the way your choice of Scala Installation is : a fixed set of jars if this is what you choose, or the latest flavor of your favorite compiler (whether 2.10 or 2.11), in case you select a dynamic installation. If you want to use a custom version of Scala with your project, there has always been the option of having a manually-managed classpath. You can either use the Add External Jars function for the Java Build Path preference page to set up your scala-compiler and/or scala-library (etc) jars, or you could use sbteclipse with the withBundledScalaContainers:=false option, which copies exactly the settings resolved by sbt. But using this is tedious, and it’s per-project. 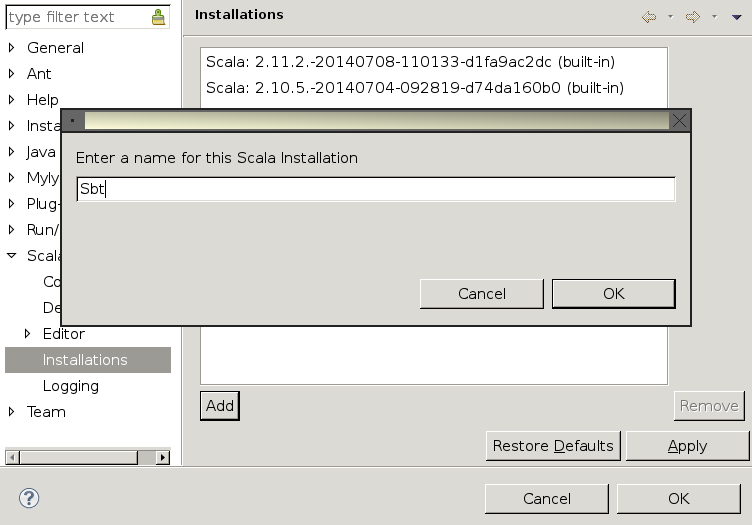 How about setting a custom, workspace-wide installation that your projects can then reuse ? 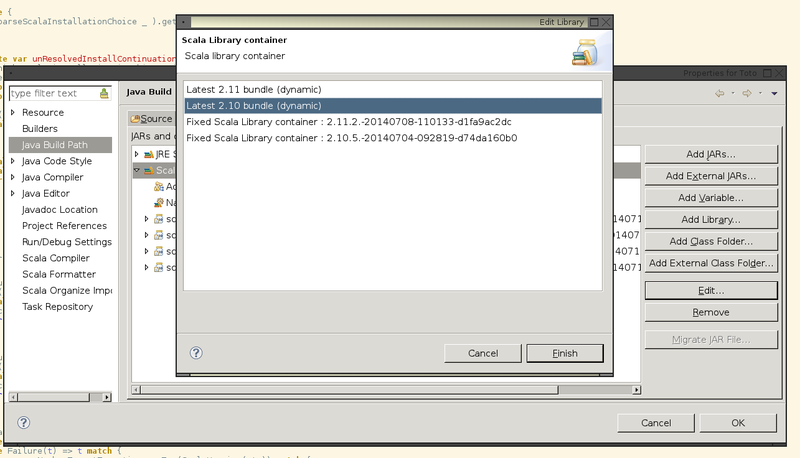 This is what you can do from the Scala Installations preference page. You will find it in the preference page for the workspace. 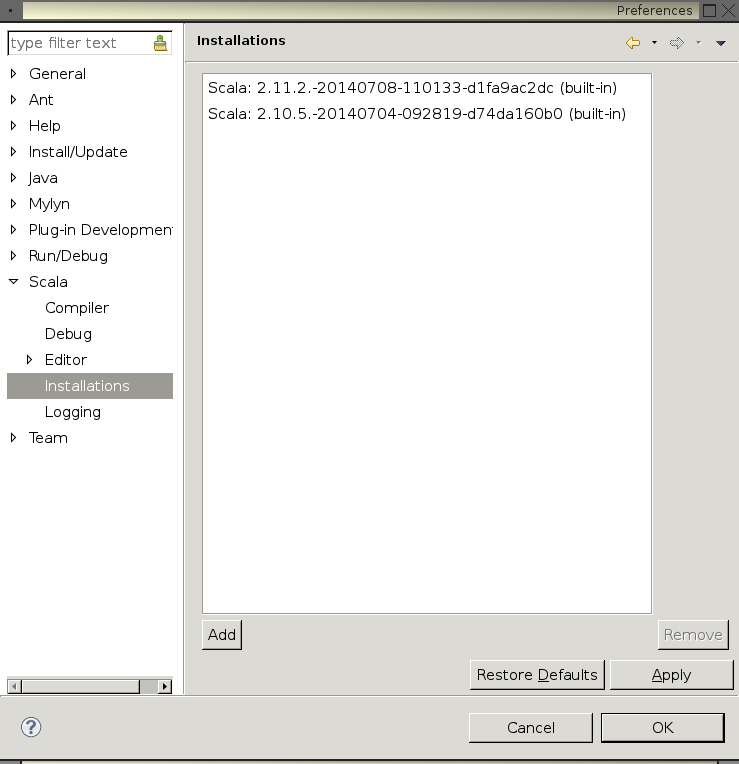 It will try to do a best effort to understand the version of your installation given what we know of how such jars are produced by the compiler build10 , and try to check those jars version is consistent with each other. 1 One important exception to this is building, which is a batch-mode task that can be delegated to another piece of byte code. 2 In other terms, there's no way for you to generate class files for a 2.10 code base using a 2.11 compiler and this option. 3 If you are dealing mostly with 2.10 projects, you may be interested in the 2.10 flavors of the Scala IDE. 4 The IDE will not lose Scala installation during normal operation, or through upgrades. But that may occur if you remove files on your disk, or explicitly remove components (bundles) of your IDE installation. 6 Notice that this means that the expansion of white-box macros is not currently possible in the compatibility 2.10 mode. Indeed, macros have known important recent developments between 2.10 and 2.11 which makes type checking compatibility between the two extremely difficult. If you have a significant project that uses 2.10 whitebox macros, you may want to look at 2.10 flavors of the Scala IDE. 7 We'll see why and how a classpath might not be expanded in a moment. 8 Note that this is also the way, in its default operating mode, that sbteclipse generates ScalaIDE configurations. If you want sbteclipse to generate an explicit classpath, preserving the scala version sbt would have chosen for you, you can set the option `withBundledScalaContainers` to false. More details on using it there. 9 If you need to know, the issue here is on refreshing the Java Build Path window, rather than modifying both classpath containers in the background. We'd be very eager to receive a contribution from an Eclipse expert on that point ! 10 Technically, we use the `library.properties` file of your scala-library jar.